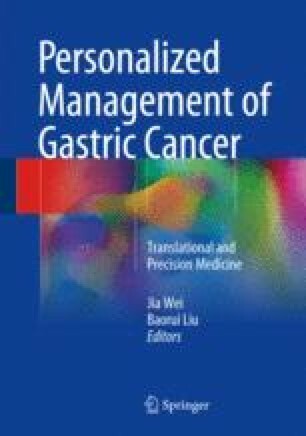 Gastric cancer is one of the most common cancers and a leading cause of cancer related death worldwide. As to the diagnosis of gastric cancer, both regular systemic imaging and locoregional imaging are of great importance. Besides, there are still other ways for the detecting of gastric cancer, including the early detection of gastric cancer by endoscopy, the detection of gastric-cancer related biomarkers and circulating tumor cells (CTCs) of gastric cancer. However, conventional diagnostic methods usually suffer from lack of specificity and sensitivity. Nanomedicine provide a promising direction in the diagnosis of gastric cancer. Moreover, nanomedicine is also capable of integrating the functions of diagnosis and treatment together (theranostics). In this chapter, we summarize the use of nanomedicine in the diagnosis and theranostics of gastric cancer.